About 10 of us gathered on 8/16/2012 for an open jam at the Agile 2012 conference to brainstorm various ways one might attempt to ‘visualize agility’. Various metrics were discussed (including a number that we all agreed had absolutely no value) and posted on a grid with ‘potential value’ on the ‘Y’ axis and ‘potential for evil / abuse’ on the X. It was interesting to observe that a slope emerged; in general, metrics with the greatest potential for abuse (evil) were also those judged to provide the least value. There were a few outliers. One in particular, “Using the the Dreyfus Skill Model” to identify the skill level of team members had great potential value but also had great potential for misuse. Thanks to everyone who came by to participate. The discussion was lively and entertaining. The results of the exercise appear below. Thanks to everyone who joined in on the conversation. 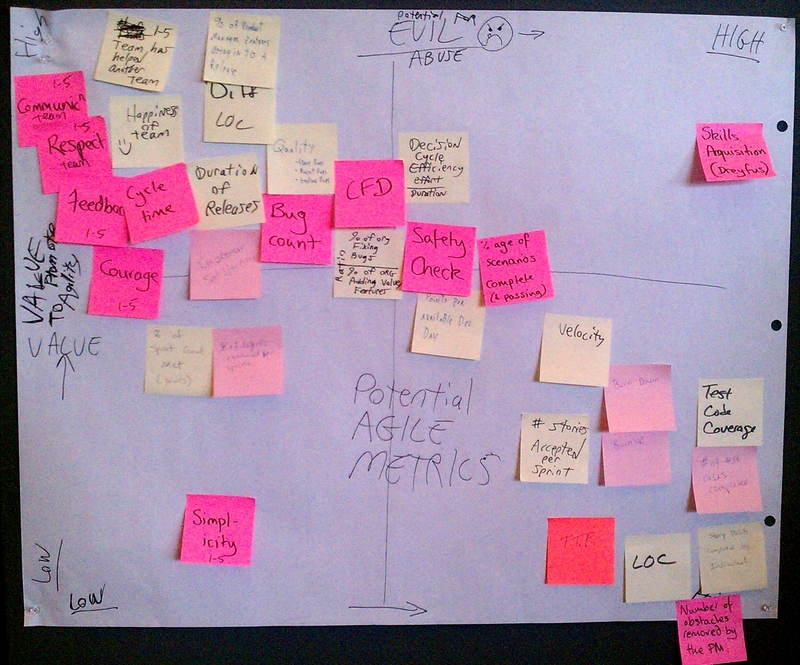 Various metrics for measuring ‘Agility’ plotted by ‘potential for value’ vs. ‘potential for evil’.